*Fighting still with the bench press. Moving up on other major lifts. *Positive. Struggled with this one before the trip to California. Fast last two reps.
*Overdid it slightly on the squats and deadlifts with too much weight. Good work though. *Not a great day. Not sure if it was the weights or being in the morning. Will try eating breakfast first next week. Setting: 3 hours sleep. Long day at work. Mostly with me being irritable. Did not alter nutrition to include more carbs to fuel the workout. Got to the gym late after a long conversation with my Grandmother after work. One more nasty protein shake and 1-mile warmup at 6:15 pace to begin a workout that I haven’t completed at this speed this year. 8x400m (456m to be exact) @ 4:40-ish mile pace with 3 minute rest. I hated Rep 1. I was sure I was going to quit after Rep 2. But despite not feeling well, I kept running. Hard. By rep 5, I could see that people on my indoor track in the gym were noticing. What’s this guy’s problem? Maybe that’s just me talking. All I can remember is looking up at the white gym lights in the ceiling and gasping for air after every rep. A good rep, when the split read 1:20 or 1:21 on my watch, usually meant relief. 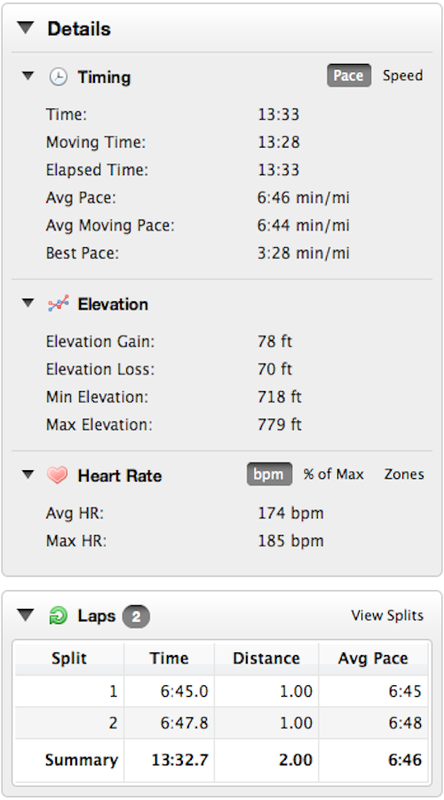 The times were so important, on the last four reps. Any failure – 1:23 or above – probably would have broken my spirit. When I’m that tired, there’s no strategizing. No working on this form or that step or whatever. Just going…almost unconsciously. 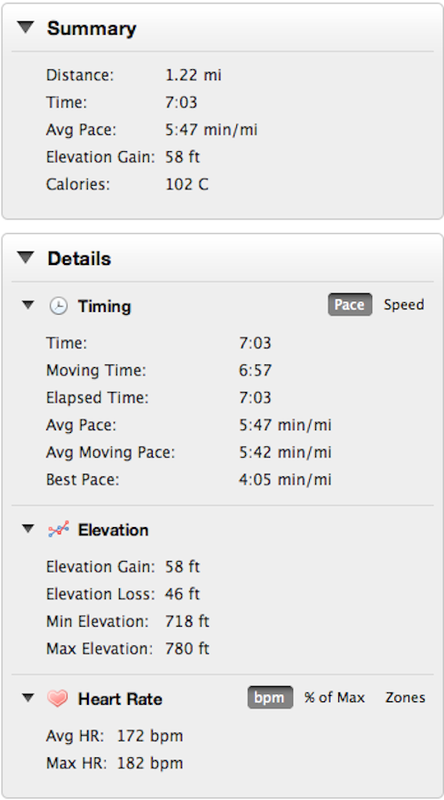 To top it off, I closed with another 6:15-mile as a cool down. Probably the best workout that I’ve had in the last two years, given the circumstances. 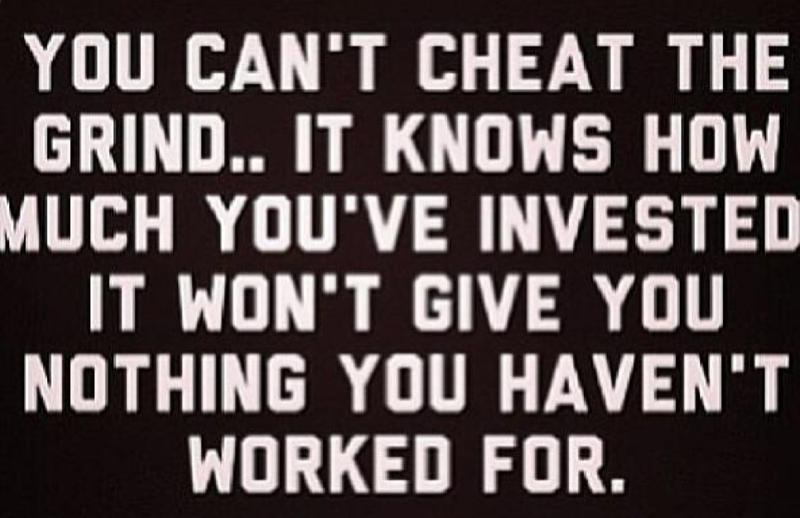 Just hope that it pays off soon. Sleep was an up and down thing…no pun intended. Struggled for most of the week, see the note on “The Miracle” above. But pulled it together later. Protein and nutrition worked to an extent. The good news is that my diet was executed to plan. I ate the SAME THING from Monday to Saturday. 1800 calories. Same meals. Same time. Same water consumption. Same protein shakes before and after the workout. A little disappointed that after Wednesday that the scale really didn’t reflect my effort. There were moments when I was staring at a bag of chips, or sitting next to the phone thinking, “Call that pizza guy.” But I didn’t do it. The question: “How much do you want it?” seemed to be enough to move me along. As long as I was able to provide an affirmative answer. Plus, the more moments I had where I sacrificed, the less I wanted those moments to be in vain. That said, if I don’t see some improvement this coming week, I’ll have to adjust my food plan again. One more week. *Trying. So hard. At everything. Willing to keep making adjustments, but just once, I want to see the effort pay off. *Still struggling with this day for some reason on the bench press. Otherwise, dominant. *Tough run. The kind of day you have when you haven’t run in two weeks. Got through it. *Whoa. Powered through it again. *Felt a lot better than Tuesday. Had a guy behind me on the track pushing me at the end. Just for fun. *Improvement. Couldn’t get through this workout two weeks ago. *No socks. No watch. No problem. Used the analog clock in the gym to keep pace. Sub-7:00 pace. Warmer weather is making it tempting to resume morning runs again, but I’m going to go with what got me to this point. Weights, intervals and eating well. So….no new tricks this week. Commit. Eat well. Train hard. Recover. Objectively going to shoot for 8 hours sleep and 120g of protein a day. I just want to see how I feel at the end of the week. *Closing time. Month 4. Four weeks to go. The fourth quarter. How much I want to win? Identified a race in Columbus that I want to run next month. Strength is good. Knees are healthy. Morning HR is looking OK. Let’s do this. Workout: 2 miles @ 6:50 pace; core work. Weather: 64 degrees, cloudy. Recap: Nice run today only because it felt easy to me. Experimented with a combination of Gatorade and Whey Protein before the run and immediately afterwards, and I think it helped. The heart didn’t really think it was an easy run, but it’s pretty simple to me at this point what happens. If I wake up underweight (de-hydrated), the heart is going to work harder during the run. Three pounds lighter this morning than yesterday. Just about explains it all. Try to remember to stay hydrated today and get that water weight back. I have a theory today. The body rewards effort with good feelings. It wants to stay in balance. If you’re working hard, it sends all sorts of nice chemicals up to help. Like when we workout. Something completely different seems to happen when I sit around for too long. So today, I’m going to work hard at everything, keep up a fast pace, and earn my rest. Let’s see what goes. Have a good day, and thanks for reading.